Figure 3. Analysis of germination and dormancy in different Lepidium spp. ('cress') accessions. 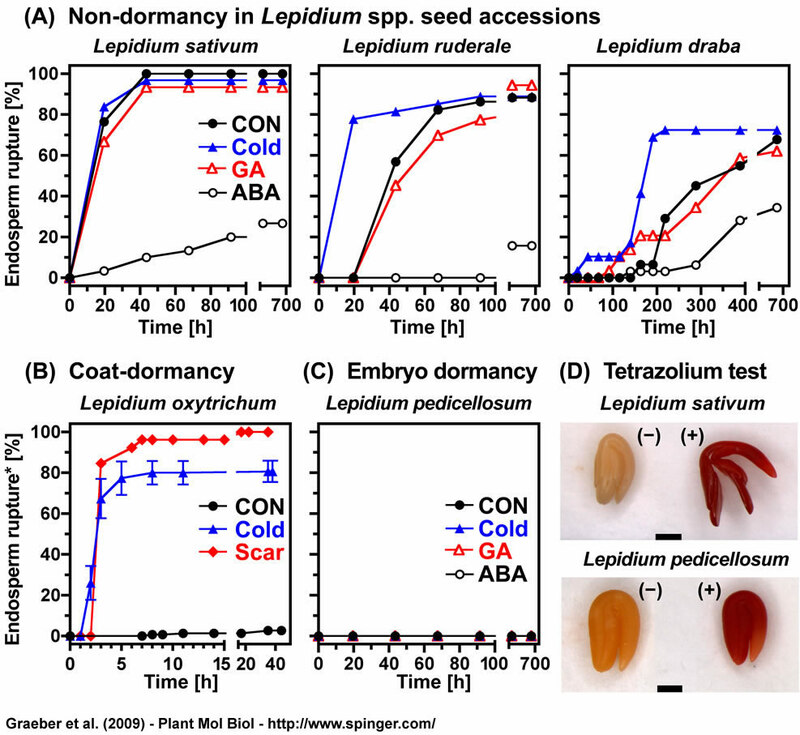 (A) The time course of endosperm rupture of non-dormant Lepidium spp. accessions and the effect of cold stratification (incubation of imbibed seeds in darkness at 4ºC from -48h to 0h), addition of gibberellin (GA = 10 µM GA4+7), or abscisic acid (10 µM ABA) to the medium (CON = without hormone additions). (B) The effect of cold stratification and scarification (cutting of the covering layers) on the time course of endosperm rupture of Lepidium oxytrichum. Based on these results the L. oxytrichum accession has coat dormancy. * Initial radicle elongation was scored in the case of scarification. (C) The effect of cold stratification and hormone treatments on the germination of the Lepidium pedicellosum accession. Note that germination of this accession was also not induced by scarification. Based on these results and a positive tetrazolium test the L. pedicellosum accession has embryo dormancy. (D) Tetrazolium test of embryo viability for L. sativum FR14 and L. pedicellosum. Left: Embryos of heat-killed seeds used as negative controls did not stain (-). Right: Embryos of both accessions develop staining (+) after 15 min (L. sativum FR14) or 20 h (L. pedicellosum) and are therefore alive. Results are representatives of 2 biological replicates with 20 embryos each. Scale bar 1 mm. After-ripened seeds were used; for statistics (A-C) and results obtained with other Lepidium spp. accessions see Table 1.